This RV Vacation took us to Fort Worth, "Where the West Begins." We found Fort Worth to be a very interesting and historic city. We spent 8 1/2 days there exploring but left many sites for next time. Compared to Houston, it was easy to get around the city by vehicle and quite a relief from the Houston traffic. It was well worth the visit. In 1849 a fort was built on a bluff overlooking the Clear and West forks of the Trinity River and named Camp Worth, for US Army General William Worth, hero of the Mexican War. 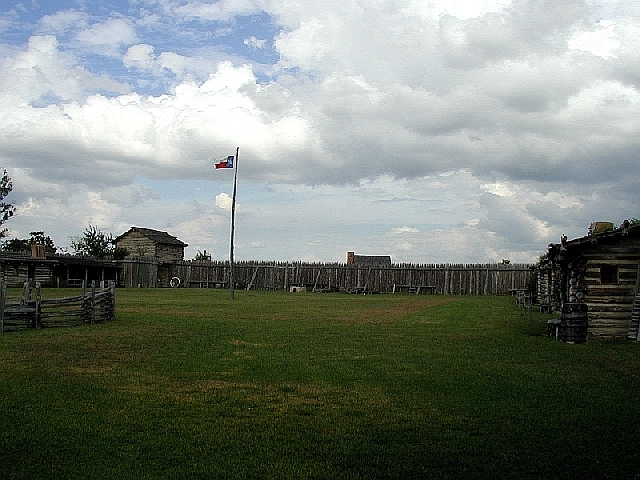 During the 1860s Fort Worth suffered from the effects of the Civil War and Reconstruction. Gradually, however, the town began to revive. It was the developing cattle industry, however, that really began the community's economic boom. Known as Cowtown, Fort Worth offered cowboys a respite from the cattle drives to Abilene, Kansas. Northern cattle buyers established their headquarters in the town, and attracted new businesses. 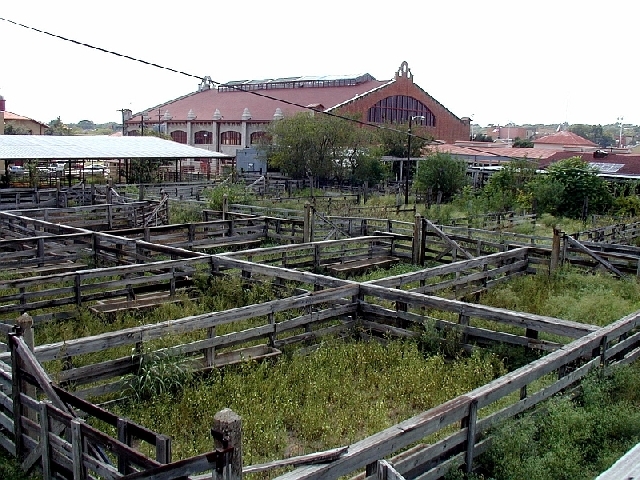 In North Fort Worth businessmen founded the Fort Worth Stockyards Company. Armour and Swift decided to locate a meat-packing plant in Fort Worth. 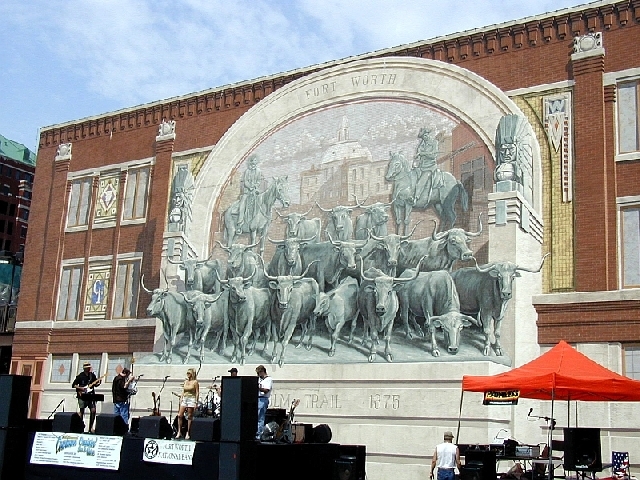 The venture was successful and, combined with the stockyards, helped Fort Worth become a leading packing-house center. With the discovery of oil in Texas, refinery and pipeline companies such as Sinclair Refining Company, Texaco, and Humble Oil and Refining Company converged on Fort Worth. 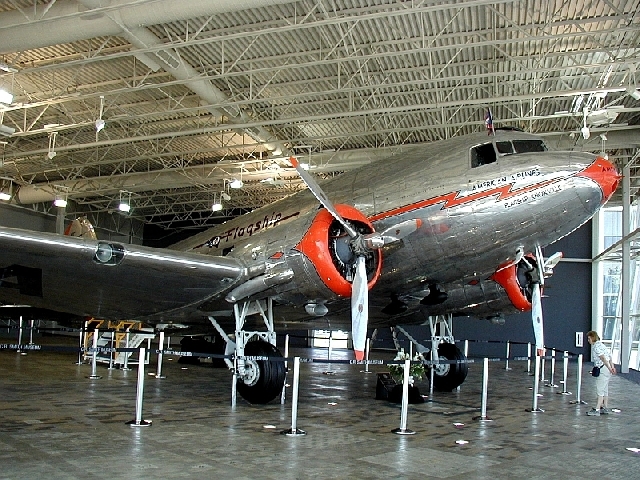 With the outbreak of World War II the aviation industry came to Fort Worth. 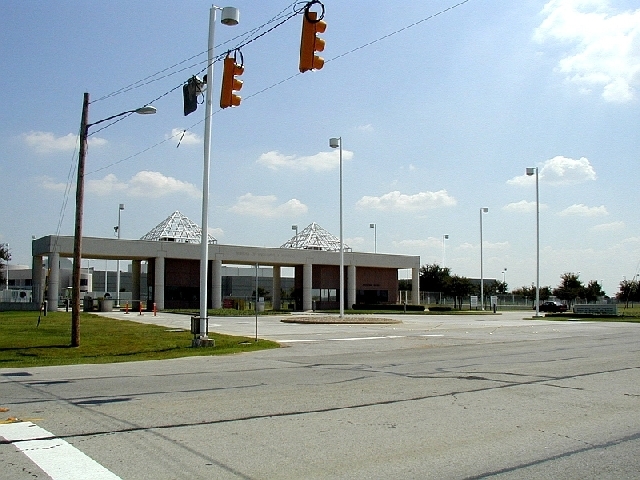 The Army Air Force located the Tarrant Field Air Drome, which in 1948 became Carswell Air Force Base, a part of the Strategic Air Command and a station for the B-36. Texas Christian University, Texas Wesleyan College, and Southwestern Baptist Theological Seminary provided higher education. 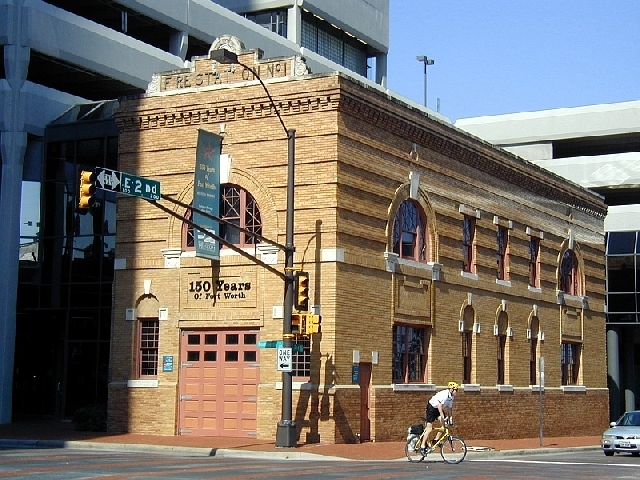 In spite of increasing urbanization Fort Worth has retained its western flavor. Tuesday morning, September 14th, we left Richmond via FM-359 north. At Hempstead, we took TX-6 to where it intersects TX-14 north of Calvert. Then up TX-14 to just south of Mexia, where we stayed the first night at Fort Parker State Park, a nice wooded park located on Fort Parker Lake. In the late afternoon, we drove around to the other side of the lake and visited the reconstructed historic Old Fort Parker. Fort Parker was the site where nine year old Cynthia Ann Parker was captured in 1836 by Comanche Indians. She grew up, married a Comanche chief and lived with the Indians until recaptured with her 2-year-old daughter, Prarie Flower, 24 years later in 1860, by Texas Rangers. She was mother of the last great Comanche chief, Quanah Parker. She never adjusted to the white society and made several unsuccessful attempts to flee to her Comanche family, the only family she really knew. After we got back to the trailer, we decided to take a walk down the nature trail near the campground, even though the weather was starting to threaten rain. We only made it a short distance before it started to drop rain on us. We made it back to the trailer just in time! It came a good thunderstorm thereafter for over an hour. Wednesday morning we went out and explored the nature trail from the day before. On the trail we saw lots of birds in the tall trees, but most were too high up and difficult to identify due to the bad viewing against the bright sky background. However, we did see a female downey woodpecker that came within a few feet - ignoring us to peck for insects on a dead tree limb. We also saw a group of "Slate-colored" or Northern Junco flying out from the trees into a clearing, catching bugs on the fly. We left the park around noon and at Mexia, we took TX-171 west. At Malone, we went north on TX-308 to TX-157, then US-287 into Fort Worth. We stayed at the Lakeview RV Park near the western shore of Lake Arlington. 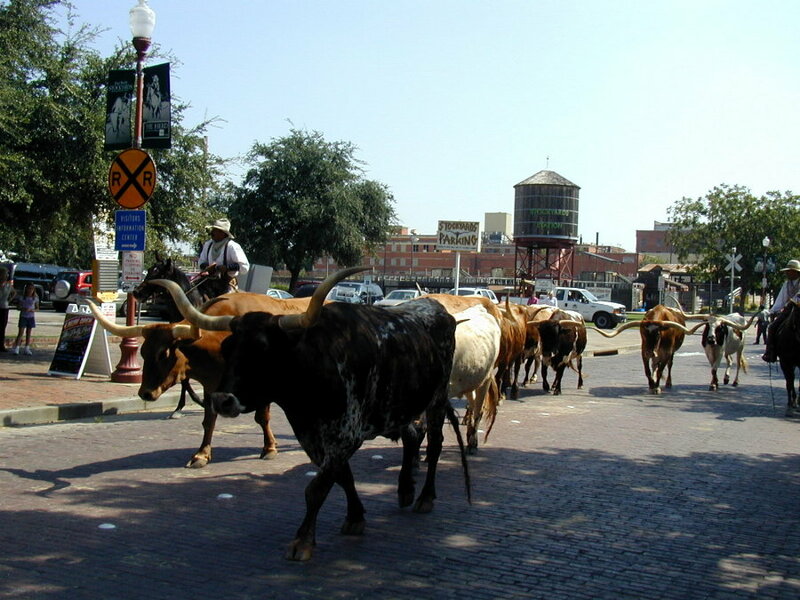 Thursday, we went into downtown Ft. Worth to the Stockyards National Historic District. We went to the Stockyards Visitors Center and picked up literature and viewed a short movie on the history of the district. At the Livestock Exchange building, we toured the Stockyards Museum which has photos and memorabilia from early stockyard days. Afterwards, we watched the cowhands drive the Fort Worth Herd of 15 Texas Longhorn cattle down Exchange Avenue to their pasture. We ate lunch in the hog and sheep pen building - now converted into shops, restaurants and other tourist attractions. After lunch, we toured the Cowtown Colesuim, a large indoor Rodeo arena. Next we went through the Texas Cowboy Hall of Fame. 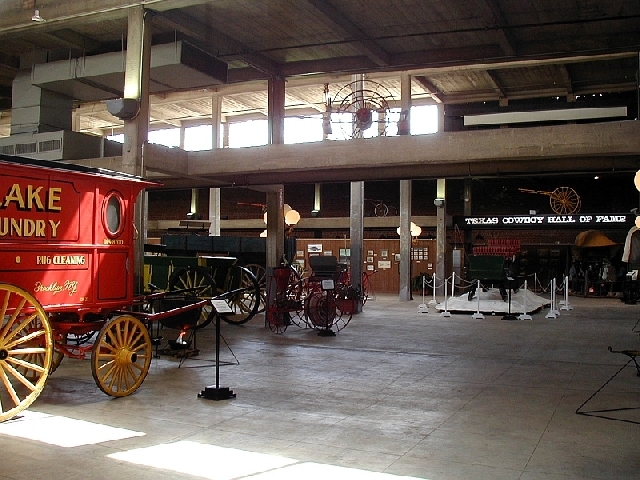 In addition to the cowboys and cowgirls highlighted, the museum also features the Sterquell Wagon Collection. We then drove over to the backside of the district and took an elevated walkway over the remains of the outside cattle pens. We then drove back into the Downtown District and out 7th Street, looking for the old house that Kay's mother lived in during the 1940’s. The house was gone, but we saw the old Montgomery Wards warehouse that was nearby. Friday we went to the Downtown District Visitor Center and picked up some more brochures. We then drove to the north side of Fort Worth to the Bureau of Engraving and Printing’s Western Currency Facility for a tour. This Fort Worth facility was opened in 1991, and tours just started up this spring after 9/11. As you might expect, the security was super tight. They don’t allow cameras, of course, but don't even allow cell phones inside! The guided tour via an enclosed elevated walkway lasted over an hour. They explain all the different steps to print and process US currency. They also show a 15 minute video and have a very good museum, explaining in detail all the steps in making money. An interesting fact we learned is that the two printing locations, Washington, D.C. and Fort Worth, use 19 tons of ink per day in printing the currency. This was an excellent tour. After lunch, we went to DFW Airport to the American Airlines, C.R. Smith Museum. This is a very good corporate museum on the history of American Airlines and the airline industry as a whole. They have an excellent large screen IMAX type movie that takes you to some of the places American flies. They have an old DC3 airplane inside, in addition to many other props and displays. This is another very good museum. After the museum, we drove to Plano and visited Kay’s cousin and wife - Milton and Molly. 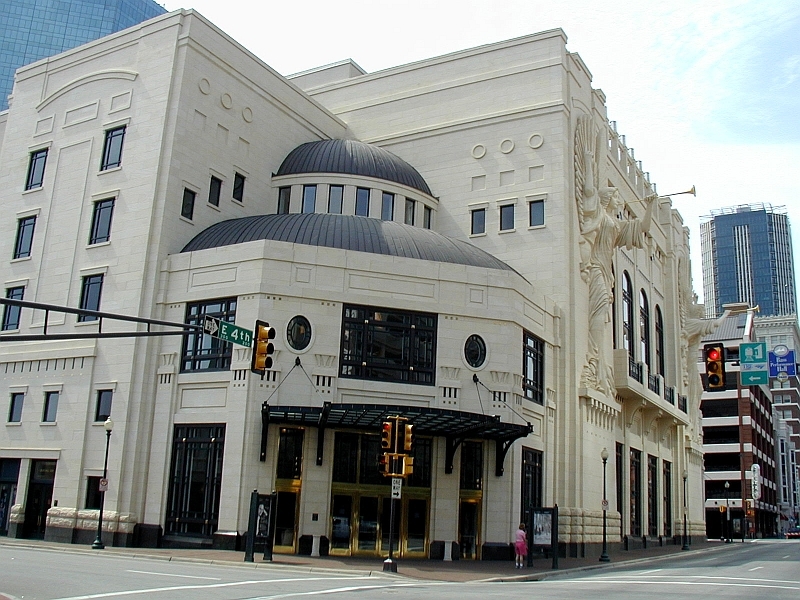 Saturday we went to downtown Ft. Worth and took a guided tour of the Bass Performance Hall, where the Fort Worth Symphony Orchestra performs. It was an interesting tour, lasting about an hour. We were impressed with the beauty of the hall so we purchased tickets to that night’s performance with Markus Groh at the piano. After lunch at the Corner Bakery, we walked around the downtown Sundance Square area looking at the hundreds of antique cars on display in an antique hotrod auto show. Also interesting is a mural painted on the side of a building showing a scene from the old Chisholm Trail. Afterwards the went back to the trailer to rest up and dress for the performance that night. We enjoyed the performance in the very impressive building - said to be one of the 10 best halls for acoustics in the world. Sunday, after a late start to the day, we attended church services at Travis Avenue Baptist Church. After lunch at our trailer, we went back downtown and toured the museum at Fort Worth Fire Station #1. The museum houses exhibits for 150 Years of Fort Worth History. Afterwards, we went to the Texas Christian University campus and drove around some, looking at the campus. We stopped at the Technology building and looked around inside, then returned to the trailer for the night. Monday we spent the entire day at the Ft. Worth Zoo. 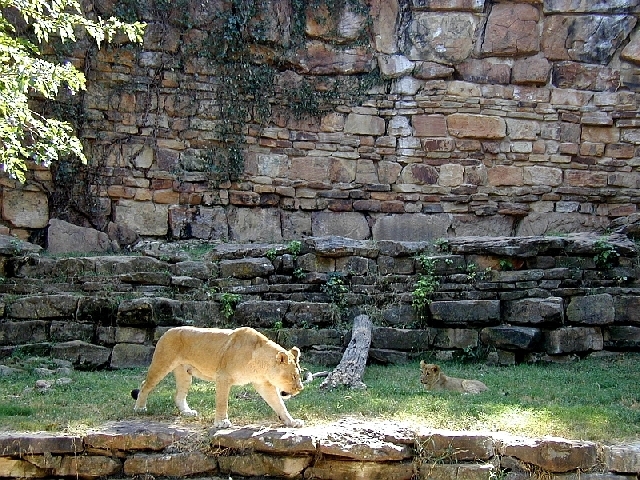 The zoo was founded in 1909 and is the oldest continuous zoo site in Texas and one of the top-rated zoos in the nation. The animals are housed in large natural settings, so they don't look caged. Tuesday morning, we went to the Japanese Garden. 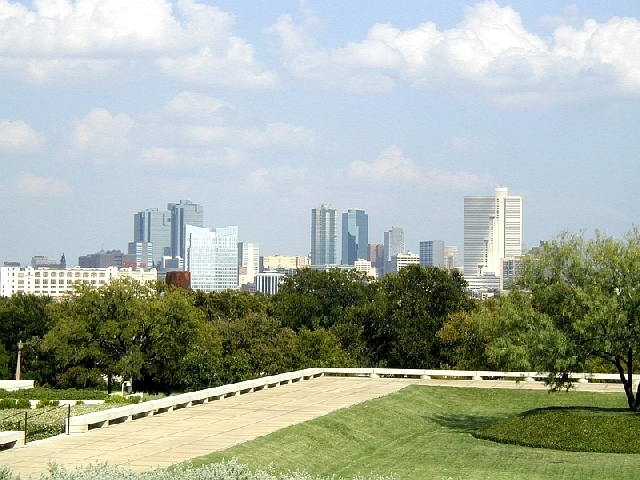 It is located adjacent to the Fort Worth Botanic Garden. 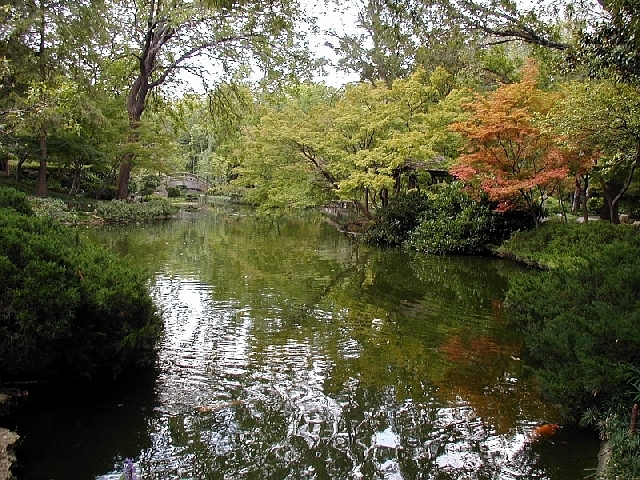 The Japenese Garden is a very picturesque and peaceful place within a short distance from downtown. In the afternoon, we went to the Amon Carter Museum. This large museum features American art. It contains a collection of paintings and sculpture by Frederic Remington and Charles Russell, as well as a large American photography collection. Wednesday morning we went to the Fort Worth Botanic Garden. It was an off-peak time for flowering plants, but it was still a nice park to visit. The setting is a forest of large trees providing lots of shade. 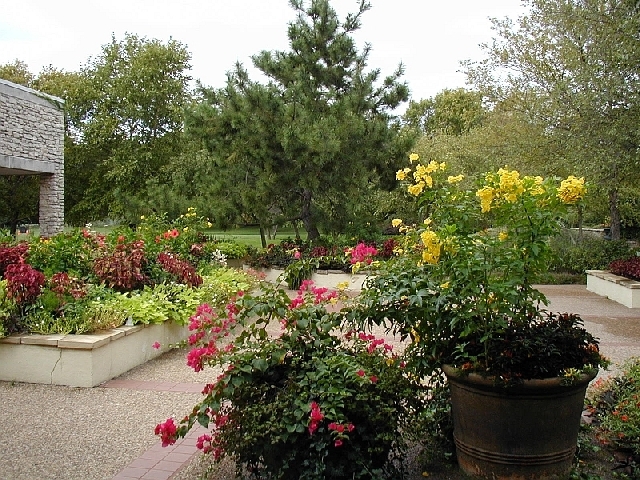 The various gardens highlight different plant species such as roses and azaleas. After lunch we toured the Conservatory, a 10,000-sq.-ft. glass-enclosed structure. It contains more than 2,500 tropical plants native to Central and South America. Small waterfalls, ponds and pathways are throughout. Afterwards, we drove downtown and went through the Tarrent County Courthouse. 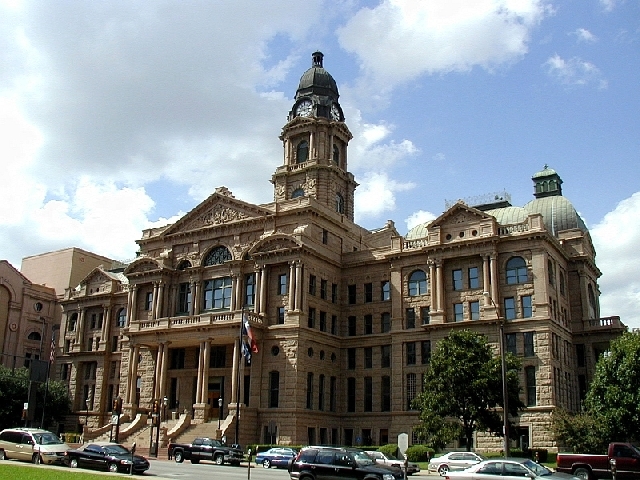 The building is well preserved and we were told that it was judged to be the 2nd most beautiful courthouse in Texas. It contains a museum of Fort Worth history, highlighting the time when it was a fort. The halls of the building contain many old pictures and paintings from the 1800’s. We then drove out west of the downtown looking for the "new" parts of the city, to see what types of houses were being built. We never really found it. Everywhere we went within the I-820 Loop was mostly old, mostly run-down, mostly minority neighborhoods. On our way back home, we stopped and ate dinner at a Golden Corral and then drove through Southwestern Theological Seminary's campus. It is a very nice campus with many large old buildings (and some new ones), large trees and nice green grass lawns. Thursday morning we went to the Log Cabin Village. 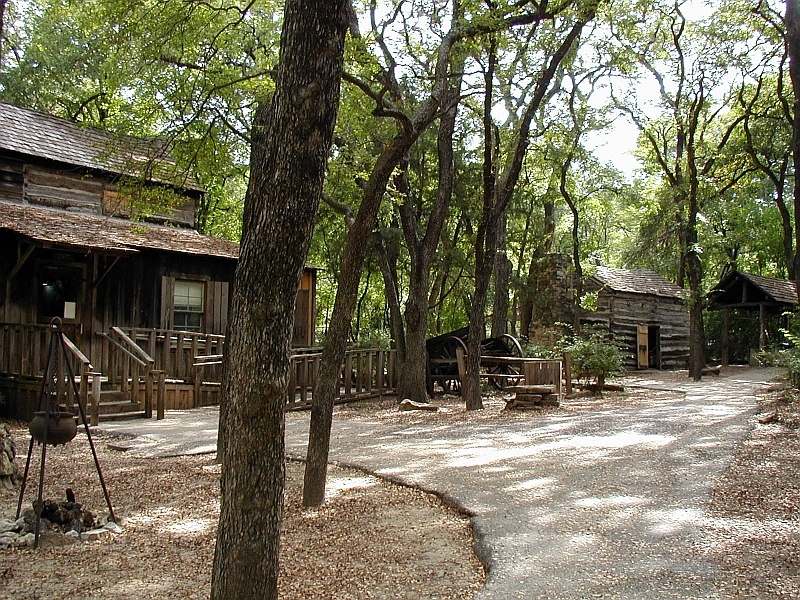 It consists of seven authentic pioneer homes built during the 1850s. Afterwards, we visited the Cattle Raisers Museum. This is a very good museum showing the colorful history of the Texas ranching industry in exhibits, films, photos and cowboy memorabilia. Afterwards we went to the Omni Theater at the Fort Worth Museum of Science and History to see their large-screen movie of "Forces of Nature". We experienced earthquakes, volcanoes and severe storms from our comfortable seat! We then went back to Southwestern Theological Seminary to see the Tandy Archaeological Museum. 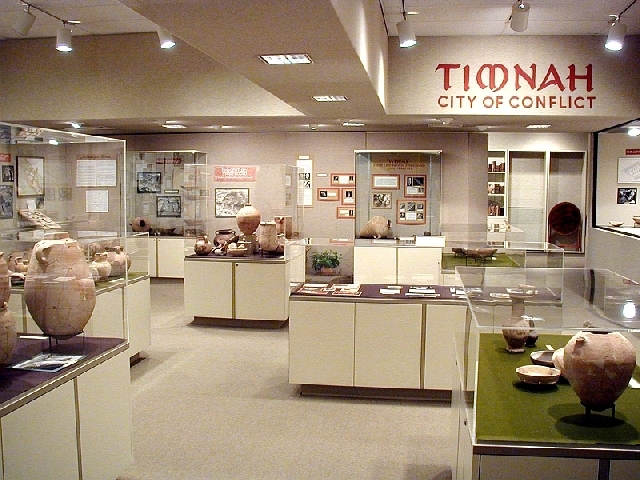 The museum contains a display of the artifacts discovered in various archaeological digs at the ancient Jewish city of Timnah. The artifacts are on loan from Israel. 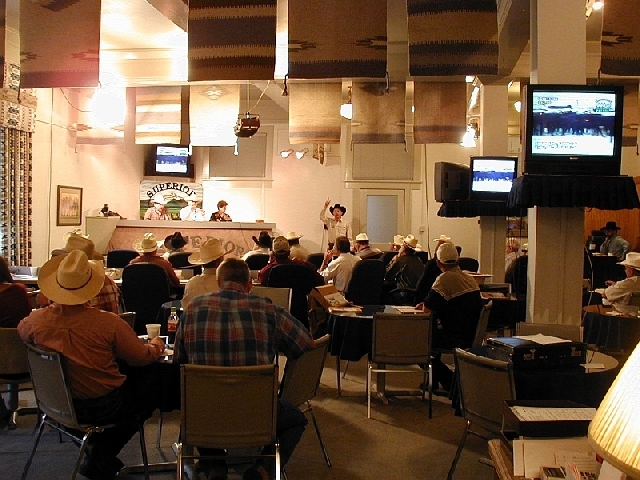 Friday morning, we drove back to the Stockyards Historic District and watched some of the local cattle buyers work their trade at a 21st-Century satellite television auction conducted nationwide by Superior Livestock Action Company. This is the modern way to buy and sell livestock without getting your feet dirty. It was very interesting to watch how fast the herds were sold and the prices they brought. Afterwards, we drove to downtown and looked around the Fort Worth Convention Center and the Water Garden near it. The water garden is dry now after the death of some children trying to swim in it recently. We then drove by the old Santa Fe Train Depot which is now used for a flea market, I believe. We went back to the trailer, ate lunch, then started back toward Richmond. For the night, we stopped at the Running Branch Campground and Marina on Lake Limestone near Marquez, TX. Saturday morning, we left and arrived in Richmond in the early afternoon. This draws to a close our Fort Wort RV trip. We hope you enjoyed the pictures and brief descriptions of our activities. God willing, join us again for another RV adventure soon.